Polyimide Kapton® Labels are lead-free ( Pb free labels ) & meet RoHS standards. Use – ImageTek Labels LMK1000 is designed for barcode or alphanumeric identification of printed circuit boards, or related electronic components. LMK1000 is also suitable for ISO clean-room applications when used with a film liner. 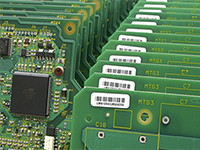 It is the ideal label to withstand surface mount board processes on either the top or bottom side of the board. It can also be used on the top side of the board in mixed processes, and is recommended for the bottom side which is directly exposed to the wave solder environment. Description - Image-Tek LMK1001 is a UL approved, fire retardant 1 Mil polyimide film with a permanent pressure sensitive acrylic adhesive and a high opacity, gloss white topcoat specifically designed for lead free thermal transfer printing applications. UL file number PGJI2.MH19503, CUL file number PGJI8.MH19503. LMK1001 also meets UL510 OANZ2 Flammability rating see UL file E323067. Description - Image-Tek LMK1003 is a 1 Mil matte polyimide film with a permanent pressure sensitive acrylic adhesive and a high opacity, matte, white topcoat specifically designed for thermal transfer printing. LMK1003 is a UL recognized material under file# PGJI2.MH19503 and CUL file# PGJI8.MH19503. LMK1003 is specifically designed for high temperature lead-free solder applications. Description - Image-Tek LMK1004 is a 2.4 Mil matte polyimide film with a permanent pressure sensitive acrylic adhesive and a high opacity, white topcoat specifically designed for thermal transfer printing. LMK1004 is a UL recognized material under file# MH19503. LMK1004 is specifically designed for high temperature lead-free solder applications. Description - Image-Tek LMK1009 is a 2 Mil high opacity gloss white polyimide film with a permanent pressure sensitive acrylic adhesive designed specifically designed for thermal transfer printing. Use – Image-Tek LMK1007 is designed for barcode or alphanumeric identification of printed circuit boards, or related electronic components. It is the ideal label to withstand surface mount board processes, on either the top or bottom side of the board. It can also be used on the top side of the board in mixed processes, and is recommended for the bottom side which is directly exposed to the wave solder environment. When matched with right ribbon this material/ribbon combination passes the requirements of MIL-STD-202G, Notice 12, Method 215K and MIL-STD-883E, Notice 4, Method 2015.13. Description - Image-Tek LMK1009 is a 2 Mil high gloss white polyimide film with a permanent pressure sensitive acrylic adhesive designed specifically designed for precision thermal transfer printing. Use – Image-Tek LMK1009 is designed for barcode or alphanumeric identification of printed circuit boards, or related electronic components. It is the ideal label to withstand surface mount board processes, on either the top or bottom side of the board. It can also be used on the top side of the board in mixed processes, and is recommended for the bottom side which is directly exposed to the wave solder environment. When matched with right ribbon this material/ribbon combination passes the requirements of MIL-STD-202F, Notice 12, Method 215J. Use – Image-Tek LMK1205 is designed for barcode or alphanumeric identification of printed circuit boards, or related electronic components. It is the ideal label to withstand surface mount board processes, on either the top or bottom side of the board. It can also be used on the top side of the board in mixed processes, and is recommended for the bottom side which is directly exposed to the wave solder environment. When matched with right ribbon this material/ribbon combination passes the requirements of MIL-STD-202F, Notice 12, Method 215J and MIL-STD-883E, Notice 4, Method 2015.13. This material is EU and China RoHS Compliant. Description - Image-Tek LMK1252 is a 2 Mil polyimide film with a permanent pressure sensitive acrylic adhesive and a high opacity, high gloss, yellow topcoat specifically designed for lead free high resolution thermal transfer printing applications (600dpi). Use – Image-Tek LMK1252 is designed for barcode or alphanumeric identification of printed circuit boards, or related electronic components. It is the ideal label to withstand surface mount board processes, on either the top or bottom side of the board. It can also be used on the top side of the board in mixed processes, and is recommended for the bottom side which is directly exposed to the wave solder environment. When matched with right ribbon this material/ribbon combination passes the requirements of MIL-STD-202G, Notice 12, Method 215J. Description - Image-Tek LMK1300 is a 2 mil semi-gloss polyimide film with a chemical resistant, high-temperature permanent pressure sensitive acrylic adhesive and a high opacity, white topcoat specifically designed for barcode or alphanumeric identification of printed circuit boards, or related electronic components using thermal transfer printing. Use – Specifically designed for high-temperature lead free solder applications. The adhesive is more chemically resistant then the standard 2 mil acrylics. It is the ideal label to withstand surface mount board processes, on either the top of bottom side of the board. It can also be used on the top side of the board in mixed processes, and is recommended for the bottom side that is directly exposed to the wave solder environment. Recommended ribbon for this product is LMW3000. Description - Image-Tek LMK140 is a special 1 Mil semi-gloss polyimide film with a high temperature permanent pressure sensitive acrylic adhesive and a high opacity, gloss white topcoat designed specifically for low electrostatic charge. When the label is peeled from its release liner, less than 25 volts per square inch of electrostatic charge is generated, making it safe to use in a static free work environment per EIA 625 and 541. It is RoHS compliant and can survive lead free PCB processes. Use – Image-Tek LMK1400 is designed for barcode or alphanumeric identification of printed circuit boards, or related electronic components. It is the ideal label to withstand surface mount board processes, on either the top or bottom side of the board. It can also be used on the top side of the board in mixed processes, and is recommended for the bottom side which is directly exposed to the wave solder environment. When matched with right ribbon this material/ribbon combination passes the requirements of MIL-STD-202G, Notice 12, Method 215K and Mil Standard 883E, Notice 4, Method 2015.13. UL Recognized. Description - Image-Tek LMK1402 is a special 2 Mil semi-gloss polyimide film with a high temperature permanent pressure sensitive acrylic adhesive and a high opacity, gloss white topcoat designed specifically for low electrostatic charge. When the label is peeled from its release liner, less than 25 volts per square inch of electrostatic charge is generated, making it safe to use in a static free work environment per EIA 625 and 541. It is RoHS compliant and can survive lead free PCB processes. Use – Image-Tek LMK1402 is designed for barcode or alphanumeric identification of printed circuit boards, or related electronic components. It is the ideal label to withstand surface mount board processes, on either the top or bottom side of the board. It can also be used on the top side of the board in mixed processes, and is recommended for the bottom side which is directly exposed to the wave solder environment. When matched with right ribbon this material/ribbon combination passes the requirements of MIL-STD-202G, Notice 12, Method 215K and Mil Standard 883E, Notice 4, Method 2015.13. UL Recognized. Description - Image-Tek LMK1509 is a 2 Mil polyimide film with a permanent pressure sensitive silicone adhesive and a high opacity, medium gloss, white topcoat specifically designed for lead free thermal transfer printing applications. Description - Image-Tek LMK1603 is a special 1 Mil polyimide film with a permanent pressure sensitive acrylic adhesive and a high opacity, semi-gloss, white topcoat specifically designed to be flame retardant to the UL94 VTM-0 standard. The flame retardant performance is achieved without the use of halogenated flame retardant materials which make it suitable for electronics applications. Material is RoHS, REACH and Halogen Free. Use – Image-Tek LMK1603 is ideal for the following applications. Batteries where flame, chemical, and high temperature exposure may result. Tracking labels for hand-held devices. Electronic production identification labels. UL rating label for an electronic device. Product ID and asset tracking. Low profile label applications.